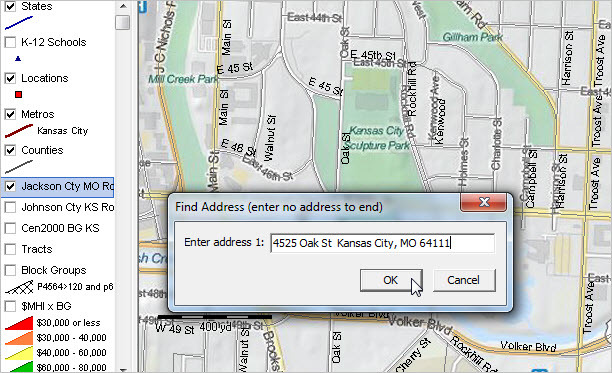 … there are many online tools that enable you to key in an address and show the location on a map. This section is focused on creating and using address-based point shapefiles in a GIS context. These methods provide similar information, showing the addresses on a map, but also enable a wide range of analytical capabilities. For example, find out how many of your addresses are in one county or census tract. Or, determine the census block or school district for each address. The above views illustrates use of Find Address tool, described below, to locate/show addresses listed below. 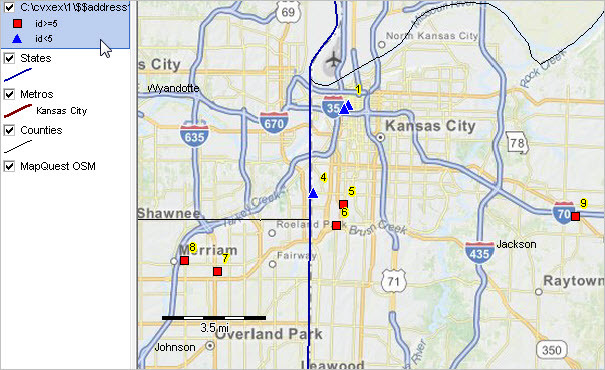 Marker/locations are shown with different markers based on a query. Markers are labeled with the point ID. Use the no-fee ProximityOne User Group version of the CV XE GIS software to enter addresses, show them on a map and automatically save the shapefile for reuse in the existing or other GIS projects. Install CV XE GIS software and enter your User Group userid. 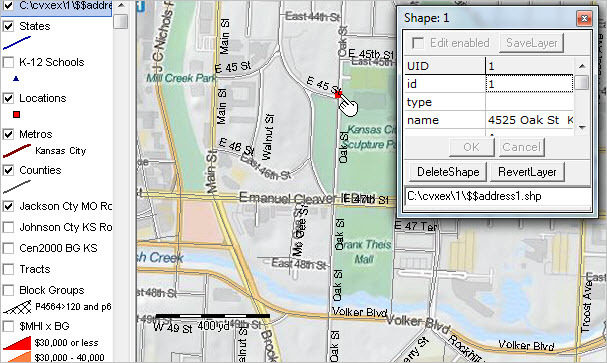 Start CV XE GIS and select the Tools>Find Address feature. After clicking Tools>Find Address, prompt appears showing default address. Enter an address or use the default value; click OK. Optionally continue adding addresses. End the process by entering null address (no value). The first step is illustrated in the following graphic using an address in the Kansas City, MO area. 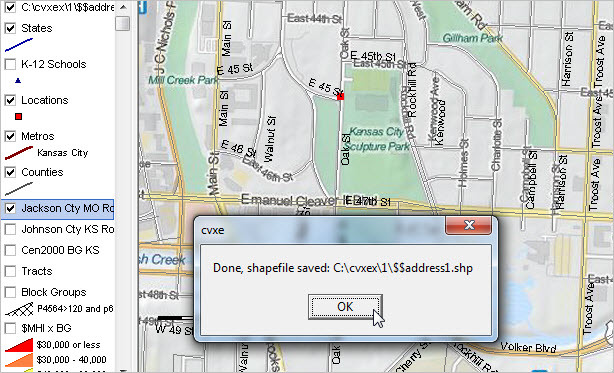 The default point shapefile name c:\cvxe\1\$$address1.shp is created as shown in message in the graphic below. In this example, only one address was entered. The address location is shown by the red marker. The shapefile is added to the existing GIS project. See legend panel top left in the graphic. The next graphic illustrates using the Identify tool to click on point which displays the mini-profile for the selected point/address. Address/point attributes that are automatically created include the point number and address in ‘name’ field. Use other features of the software to modify the marker/point appearance, label the addresses or add other attributes to each address. Unlike online address-locators and display services, using the GIS operation you can determine which in which census block or other political/statistical areas (congressional district, school district, etc.) the address is located. If your point shapefile contains many addresses there are also geospatial analysis tools that can be used. Use the site analysis feature select a group of addresses, visually on the map, and create/display a profile of aggregated data for the selection of points. You can also view the address locations in context of the matched street segment. The next graphic shows a zoom-in view. The roads/streets layer has made active (click on layer name in legend panel). The Identify tool is used to create mini-profile of matched street segment as shown in the graphic below. 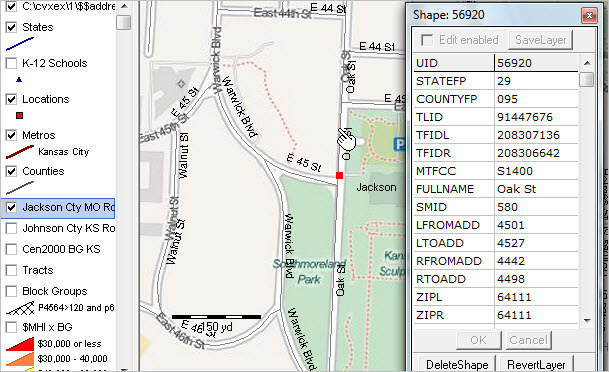 By using the road segment attributes, the census block code (and higher level geocodes) can be determined/assigned. See more about the road segment attributes. There are many other tools to create address-based point shapefiles. For example, you might have a file with existing latitude-longitude values/fields. In this case, the Find Address or Find Address-Batch operation is not needed — the latitude-longitude values have already been assigned. Creating a point shapefile by importing records with existing latitude-longitude will be reviewed in an upcoming blog post. How do neighborhood demographic-economic characteristics of New York Congressional District 12 compare to adjacent district 7? … or any other congressional district? How to assess needs of congressional district constituents? This section reviews access to and use of thematic and reference maps for each/all 114th Congressional Districts. Interactively rank, view, query and compare demographic-economic characteristics of congressional districts using online tables/tools described in this section. The CD Gallery provides new map graphics for each 114th Congressional District. Each map graphic shows patterns of economic prosperity by neighborhood in context of the corresponding 114th Congressional District. The most recent American Community Survey (ACS2013) data are used to show neighborhood patterns (based on census tract median household income).  Map view created using CV XE GIS software.  View similar thematic pattern maps for each/all congressional districts. These key approximate 600 subject matter items are based on the American Community Survey (ACS) 1-year estimates. These data update later in 2015. Similar interactive tables are available for these geographies: Census Tracts , School Districts, Cities, ZIP Codes and State.Metro.County. Use the interactive tables to view, query, rank, compare characteristics of the population, households and housing for these areas. A scroll section on each page (see links above) lists each of the subject matter items available for each congressional district via the table. .. the Hispanic population is diverse … here we share information about data and tools that can be used to examine the Hispanic population by specific origin by ZIP code. The Hispanic or Latino population group is comprised of many specific origin subgroups. The specific origin subgroups are often associated with different regions of the world. Many specific origin subgroups tend to cluster by location within the U.S. both as a result of the geography of emigration (e.g., Mexico to Texas) and association with where same subgroup emigrants have settled (e.g., Cuba to New York). This section provides insights into how the Hispanic specific origin subgroups are distributed across the U.S. by ZIP Code Area. Tools are provided to analyze geographic and subgroup patterns of interest. For more details and to access interactive table see related Web section. Labels show Hispanic population as a percent of total population. Color patterns show Mexican population as percent of Hispanic population. 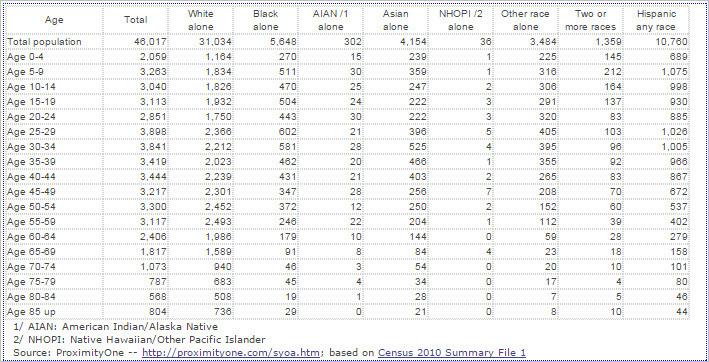 Census 2010 identifies approximately 70 Hispanic specific origin subgroups (see list). The table presented below shows the U.S. Census 2010 Hispanic population for a summary of these specific origin subgroups organized into 28 more aggregated groups. The Census 2010 population by ZIP Code for these same 28 subgroups is presented in an interactive table below in this section. This graphic below is a partial view of a table showing Census 2010 Hispanic population by specific origin. See full table in related Web section. 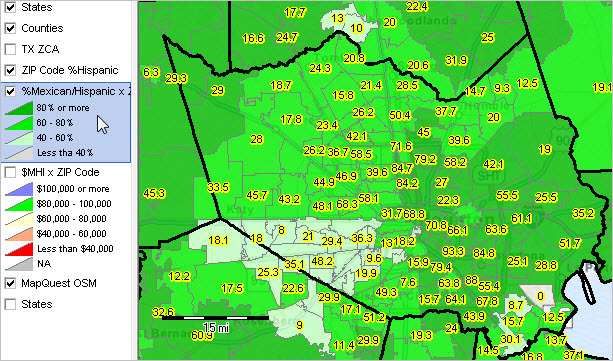 The following graphic shows the Mexican population as a percent of total Hispanic population by ZIP Code area in the Houston, Texas/Harris County (bold black boundary) area. See color/interval patterns in legend at left of map. 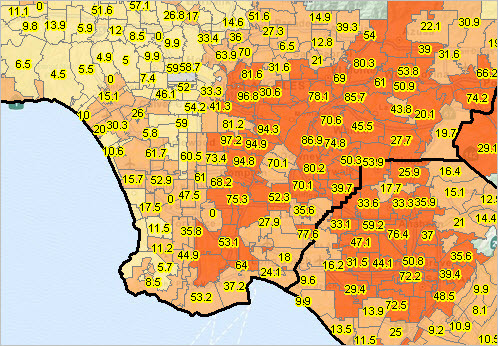 ZIP codes are labeled with Hispanic population as a percent of total population. View, rank, compare, query patterns of the Hispanic population by specific origin by ZIP code area using the interactive table. The following graphic shows a view of the interactive table illustrating Texas ZIP codes sorted in descending order on the Mexican population column. The following graphic shows a partial view of the Hispanic specific origin population items that are included in the interactive table. 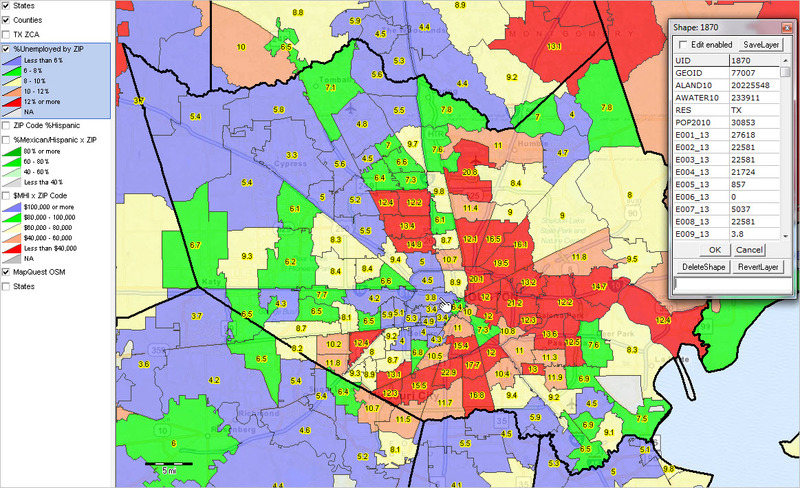 This example shows data for the Houston area ZIP code 77077. See the complete list of items in the related Web section. Link these Census 2010 demographics for ZIP code areas with American Community Survey demographics to view/analyze a broader array of demographic-economic subject matter. 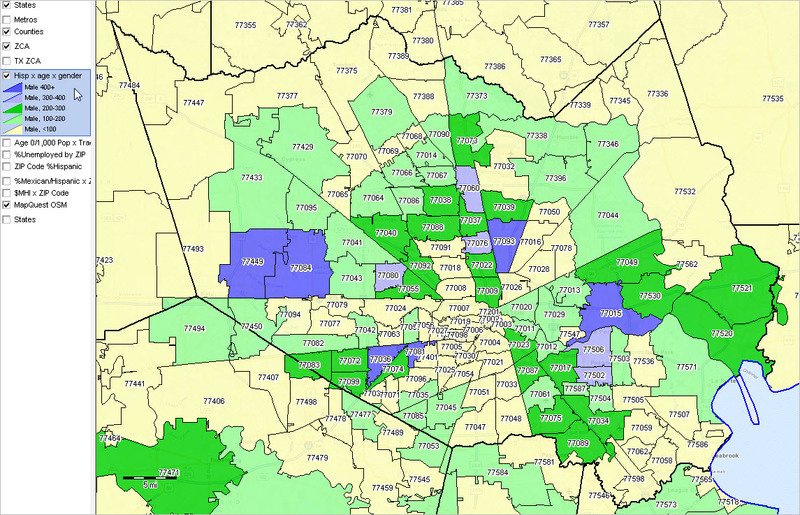 See ZIP Code Geographic, Demographic, Economic Data Resources.